After spending the day working out with his Broncos teammates at mini camp, Emmanuel Sanders spent his evening hosting his annual event An Evening with Emmanuel Sanders, a big event that helps fund his foundation. 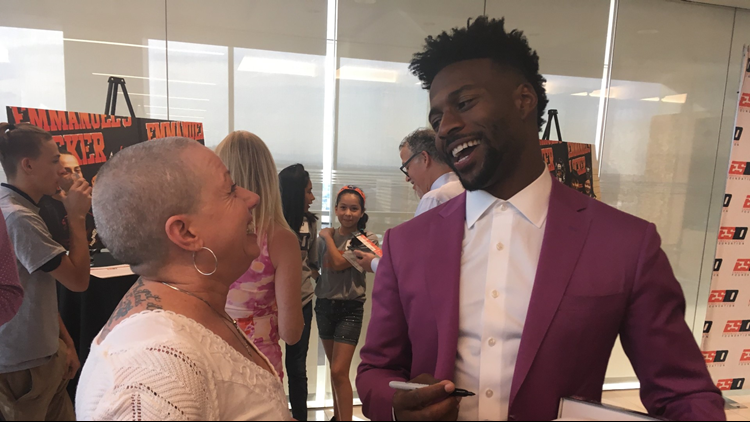 Denver — After spending the day working out with his Broncos teammates at mini camp, Emmanuel Sanders spent his evening hosting his annual event An Evening with Emmanuel Sanders, a big event that helps fund his foundation. An Evening with Emmanuel Sanders helped to raise money in support for Emmanuel's Locker, another event that provides sports equipment to children who can not afford it. "Growing up I felt like I lacked certain opportunities that other kids were afforded," said Sanders recalling his childhood days. "I wanted to give these children the same opportunities every child should be given regardless of their economic status. I want to level the playing field for them so they can succeed." Kepner Beacon Middle School was the first recipient of Sanders' first Emmanuel's Locker giveaway. Many of their students attended Tuesday night's event to spend time with Sanders and thank him for all that his foundation has done.